The D1A came out of the Imperial Japanese Navy's need for an advanced carrier-based dive bomber, and in late 1934 the IJN ordered the finalisation of the Aichi AB-9 design which was produced as the early model D1A1. However, the D1A1 was not designed by Aichi Tokei Denki Kabushiki Kaisha aircraft company, but by Ernst Heinkel Flugzeugwerke at the request of the Aichi company. The initial version designed by Heinkel was the He 50, a similar model equipped with floats instead of landing gear. The subsequent model, the He 66 was provided to Aichi who immediately began production of it as the D1A1. 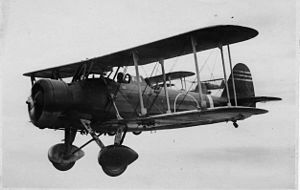 The design of the D1A was based on the He 66 and was designed as a biplane constructed of metal, with a fabric covering, a fixed landing gear and a conventional type tail landing skid. Original models had 365 kW (490 hp) engines and it was not until later models that more powerful 433 kW (580 hp) engines were included in the construction. The D1A was primarily used in the Second Sino-Japanese War and up to the time Japan entered World War II in 1941. At the beginning of the Pacific War, all of the remaining D1A1s were decommissioned and most of the D1A2s were retired from the front lines and served primarily in training units. The exception was 68 of the D1A2 model that operated as a second-line support until being retired in 1942. D1A1 Type 94 Powered by 433 kW (580 hp) Nakajima Kotobuki 2 Kai 1 or Kotobuki 3 radial engines; 162 built . D1A2 Type 96 (Sometimes referred to as the D2A) Improved version fitted with spatted wheels and a higher powered Nakajima Hikari 1 engine; 428 built . Francillon, R.J. (1970). Japanese Aircraft of the Pacific War. London: Putnam. ISBN 370 00033 1. Aichi D1A Pictures and Aichi D1A for Sale.